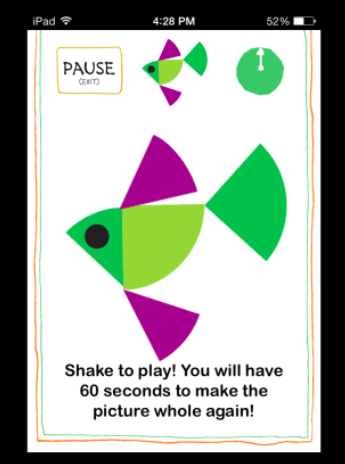 Ed Emberley’s Shake and Make app from Night & Day Studios, Inc., is a fun puzzle app for ages 4-8 (or even adults). It is currently free in the Apple Store. 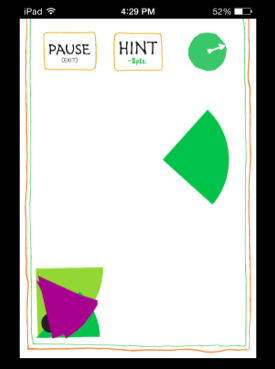 You start off by choosing your puzzle based on one of Emberley’s simple shape-based illustrations. You are then given 60 seconds to recreate the picture without a pattern to follow. There is a hint available if you are like me and need to see the picture again. While the puzzles look easy, as they are made up of simple shapes, you really test your memory in recreating the shape. I tried out this app with three of my nieces, ages 2, 5, and 8. It was really too old for the 2-year-old, as her favorite part was moving the pieces around the screen. Unless you were lucky, the pieces did not lock into place in the puzzle shape. The 5 and the 8-year-old really got into it and many times beat me as the adult. I was personally a big fan of the hint button. While I think that this would be a great app to put on department iPads, there are two issues to consider. First, the app works vertically, rather than horizontally. Second, the puzzle requires you to shake the iPad to start the puzzle. If your department has mounted iPads, then this app is not for you. On the other hand, if you check out or use your iPads in cases where kids can maneuver the iPad, then definitely add this app to your “must check out” pile. Posted on October 13, 2014, in Apps and tagged Lisa Mulvenna. Bookmark the permalink. Leave a comment.